Have you seen a square watermelon? look at the picture on the left side. I’m not kidding. This watermelon is being sold in Japan for around 10,000 yen ($83) while regular oval watermelon costs $15-$20. Quite expensive eh? here in the Philippines it won’t cost that much if you will grow it locally. There are abundant sources in the provinces but because of our poor transportation condition all of those supplies can’t reach metro manila in perfect condition and most of the time it cost higher than it suppose to be. 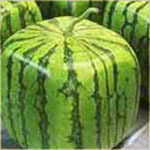 Then how about the square watermelon, are we able to make those like what they are doing now in Japan? looks like its not harder that we thought. I saw website that sell polycarbonate casing (Fig. 1 below) to mold the watermelon during the growing stage . Obviously you can’t shape it when it is already fully grown because the peel is already hard. You just have to put the fruit still attached to the vine inside the polycarbonate casing and let it grow until is occupies all the space inside and forms a cube or a square. Also it is more convenient if the watermelon have a square or cubic shape for it will not roll and you won’t have to chase it. Stacking it only requires a smaller space unlike the round or oval shape. But before you can do that, you have to know how to plant and produce ordinary watermelons as per below Watermelon production guide I got from the Bureau of Plant Industry Website. Its is planted 5000 hectare, the bulk of which is planted during the regular season (October to January) however there are few commercial off-season grower in Marinduque, Sorsogon and Pampanga. Climate – watermelon grows best when the monthly average temperature is about 21oC to 29oC. Planting is on the month of October to January. And for off- season is early August. Soil – A well drained, fairly fertile and sandy loam soil is ideal for watermelon production, however with proper it can be successfully grown in clay soil. Land preparation – Field should be prepared thoroughly by plowing and harrowing and removing the different plant debris. It should also be pulverized and leveled, furrows are made 2 meters apart. Sowing – Pre-germinate the seeds before sowing; soaking it in water for overnight period. Drill 2-3 seeds per hill at a distance of 1.5x 2,0 meter apart. Ten to fifteen days after emergence thin to one plant per hill, a hectare of land will need 3-4 kilograms of seeds. Fertilization – soil analysis is recommended but in general for organic fertilizer a hectare should need about 10-15 tons. Side dress with 10-20 grams per hill of 14-14-14 two weeks until onset of female flower. At fruit setting apply 10 grams of urea (46-0-0) and muriate of potash (0-0-60) at 1:1 ratio 2-3 times every two weeks. Irrigation – Field should be irrigate whenever necessary by either using furrow irrigation or by manual watering. Frequent high irrigation 10-15 times is recommended at planting time, vegetative, flowering and fruiting development stage. Do not allow the fruits to get wet while irrigating. Two weeks prior to maturity irrigation should be stop. Weeding and Cultivation – Shallow cultivation by off baring, 15 days after planting followed by hilling up at 30 days after planting and hand weeding thereafter until the crop have attained sufficient size to cover the soil which in turn will suppress the growth of weeds. Fruit thinning – removal of misshapen fruits, thinning of two fruits per vines of varieties which produced large size fruits and 4-6 in the case of small fruited varieties are suggested and done when the largest fruit is 10 cm long and 10 cm in diameter. Thrips, aphids, cucurbit beetle, melon fruit fly, spider mites, cutworm. Spray insecticide at manufacturer recommendation. Downy mildew, powdery mildew, mosaic, anthracnose, use appropriate chemicals in controlling these diseases by following the manufacturer recommendation. Watermelon fruits do not ripen further after picking, hence the fruits should be mature enough when harvested. It takes a watermelon to mature from 35 to 45 days after pollination. Tendril right behind each fruit dried down up to the base. Cost and Return Analysis Per Hectare. Estimated Cost and Return of Production of Fresh Vegetable for 2001. Bureau of Plant Industry. Crop Production Division. Sir Manuel, can we plant more than one variety of watermelon in one area, eg.,sweet 18, sweet 16 and musk melon? does it affects one another? I just want to know much about watermelon production, so is it true that watermelon is sensetive to high humidity? I want to know whether watermelons (pakwan) is very sensitive? A guy told me that lady visiting the land site is prohibited. I am trying to understand whether it is true or not? Also, he plans to start planting watermelons in June. I do not know whether it is the right time. Can offer me advise and clarification to what I was writing. Is it the right time to plant watermelons? I have already started with the land preparation and already bought seeds. But I’m now doubting if it’s the right time. In about a week, land preparation will be done and were off to planting. Please give me some advice before I proceed. Thanks. beside giving us the knowledge regarding watermelon we also need knowledge of hotculture at large. Thanks. haie!, i like watermelon very much.YUMMY! I have tried planting watermelon last year and it turned out not well seems i was late in planting it. I planted it on the month of may. can you give me advice on the what month i will try it. and some tips on how to have big quality watermelon. im planning to plant watermelon again this march. please i will like you to give me all the things i need about watermelon farming since am still very new in it. the square watermelons were developed by japanese. am i right? hope they can develop solo watermelons, like solo papaya. We plant watermelon,cantaloupe and vegetable only in (post harvest) after planting rice from month of december to May and most of the harvest is done on May. They can contact me in my email @ ([email protected]) because I temporarily live in Thailand and go back home in farm only when the harvest is near. heres my home number (63 33) 3292989 better they just email first. thanks!! Hello Jerry Borres., Downy Mildew in watermelon is a fungus and some of the causes is that if you’re using hay as your mulch the fungus from the hay can infect your watermelon plants ,compose also cause fungus and insects. Try to use 5 table spoon of bleaching liquid mix in 1 gallon of water., This is safe anti fungicide for you and for consumers. good luck!! Thanks. That’s a very nice tip. Hello Manuel, we’re a farmer of water melon here in Visayas region and every summer we plant watermelons, cantaloupe and some vegetable., do you have some list or website of local whole seller or exporter of watermelon,cantaloupe and vegetables here and in abroad?. Our watermelon, cantaloupe and tomatoes are ready to harvest in a few weeks.. thanks!! At the moment I haven’t got any info regarding whole seller of watermelons and cantaloupe here and abroad. But since you made a comment regarding it, maybe some visitors or readers of this blog might be interested in what you can offer. Better leave your contact number here so they can contact you. im having problem with my watermelon due to Downy mildew. I’m not really knowledgeable regarding watermelon production but I’ll look into it and give you an update if possible. For the meantime just search Google and use the term “downy mildew control” and maybe you can find the answer. thank you for sending me information regards watermelows. i can’t believe it the water melos!! !it is so BIG!!! I REAL HAPPY BY READING THE INFORMATION ABOUT WATERMELON SINCE I AM THE YOUNG PEASANT OF THIS CROP PLEASE KEEP ON SENDING ME SOME ARTICLES REGARDS IT. 3 to 4 kgs. of seeds in a hectare is too much because, your source is lying, it needs only 300 to 400 grams of watermelon seeds in one hectare.